There are three places where your body temperature can be measured. These are mouth, armpit and the rectal area. Under this section, we will be discussing the main differences between the oral and axillary temperatures. How are the Two Temperatures Taken? The basic difference between the two temperatures is the way in which they are taken. When you place a thermometer inside the oral cavity (the mouth, silly), you are actually finding out the oral temperature. Axillary temperature is taken by placing the thermometer under the armpits of a person. A thermometer designed for oral use can also be used for measuring the axillary temperature. Will the Temperature Measurements for the Different Areas Be the Same? No, it won’t. The location you are measuring the temperature at will result in different temperatures. In fact, the axillary temperature is at least a degree lower than what you would measure orally. Try it out! The temperature you measure in the mouth will be higher at all times compared to the axillary temperature. Normally, you should expect to find a difference in the range of 0.5-1 degree Fahrenheit in the two temperatures. Well, an oral temperature is actually more accurate when you compare it to the axillary temperature. An axillary temperature is actually influenced by the fact that the temperature on the outer surface of the body is being measured. Having said that, if you are dealing with very small kids- you are probably better off with an axillary temperature. It is nearly impossible and dangerous to try out an oral temperature with an infant! What are the Normal Temperature Readings for Both? If you are going for an oral temperature, you should be looking for something like 99º F. However, if you are measuring it on an axillary basis, anything above 98.6ºF is a raised temperature! How do You Take the Different Temperatures? For an axillary temperature, you will need to place the thermometer tip in the armpit of the child. You will need to wait for about a minute or two before the temperature becomes apparent. For an oral temperature, you will need to wash the thermometer with soapy water first. You should then place it far back into the tongue. It has to remain in place for about a minute. You can find out the temperature after a minute. These are the main differences between oral and axillary temperatures. 2. Oral temperatures are higher and more accurate than axillary ones. 3. However, axillary temperatures are better for infants. 4. A reading of 98.6ºF is normal for an axillary temperature while it is a degree higher for axillary temperatures. Purpa Mukherjee. "Difference Between Axillary and Oral Temperature." DifferenceBetween.net. May 22, 2014 < http://www.differencebetween.net/science/health/difference-between-axillary-and-oral-temperature/ >. Thanks for this informative article. I often get confused regarding the difference between oral and axillary temperature. I have recently heard and experienced as well that now there is no difference in axillary and oral temprature.I.e temprature measurement in axila is considered the same in mouth. And the thermometer shows the same. Is there any such change in the temprature measurement? I am realy confused as I feel my body temprature is raised but thermometer shows that its normal in axila. The reason people are confused is websites like this. First the article says the mouth will be higher and then in the summary, it says the opposite. It says the same you are the one who is confused. B is shorter than A. 4. A reading of 98.6Âº is normal for an oral temperature while it is a degree higher for axillary temperatures. So normal for auxillary would be 99.6 right? 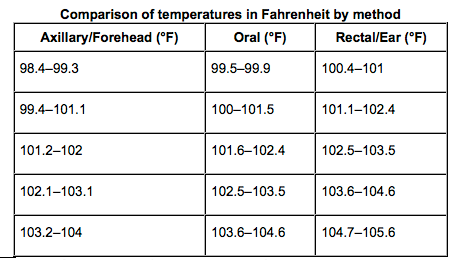 If you are going for an oral temperature, you should be looking for something like 98.6Âº. However, if you are measuring it on an axillary basis, anything above 99Âº is a raised temperature! So which is it? Is 99.6 normal or is it high? The article says that axillary temperatures are lower (meaning a lower temperature should be normal rather than a higher temperature). The article then contradicts itself by saying that 99 is normal for an axillary temperature … whereas that would correspond to an oral temperature of 99.5 or 100 degrees! I think the article writer just made a mathematical mistake … the normal axillary temperature range is lower than the normal oral temperature range. This article could have been useful if it had been written/checked more carefully. why axillary, oral and rectal temperature is differences? Just read the chart. People make mistakes in writing than in reporting numbers.